Sprout N Grow Greenhouse Sugar Baby Watermelons | BUDK.com - Knives & Swords At The Lowest Prices! Edibles are red hot! Interest in edible gardening has grown by leaps and bounds during the past few years. 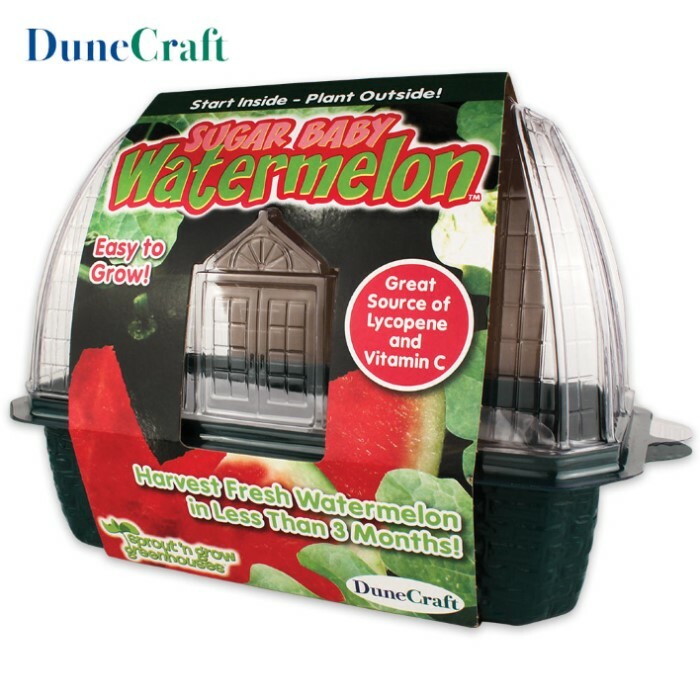 Capitalize on this new trend with the Sprout N’ Grow Greenhouse to grow your own refreshingly sweet Sugar Baby Watermelons. Sprout the plants in the greenhouse and transplant them outside or into a larger pot to grow them until harvest! Unlike ordinary large and unwieldy watermelons, these super-sweet melons are only about 8” tall, wide, and long! Watermelons contain vitamins, minerals and other useful compounds. In addition, they will attract birds, butterflies, and bees!